On October 26 a solemn event on the occasion of the Ohi Day and 74th anniversary of liberation of Ukraine from fascist invaders was held in Greek cultural center “Meotida”. 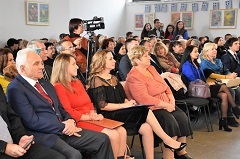 Mariupol State University, Consulate General of the Republic of Greek in Mariupol, Greek Community Federation and Mariupol Greek Society were the arrangers of this meeting. Professors and students of the Faculty of Greek Philology and Translation took part in the event. On October 25 an exhibition “Security formula. Ukraine-NATO” dedicated to the 20th anniversary of signing the Charter on a Distinctive Partnership between the North Atlantic Treaty Organization and Ukraine was opened in Mariupol State University. 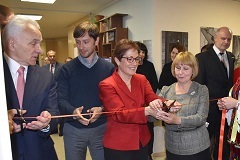 On October 24 an official opening of Mariupol information and resource center “Window to America” held at Mariupol State University. 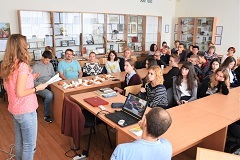 On September 28, at the premises of the Illich Iron & Steel Works Museum of History the third dialogue meeting within the framework of the "Mariupol Space for Peace" Project took place. 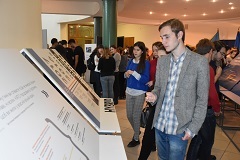 The event was held in the human library format "Religious Variety of Pryazovia". Today in Mariupol State University there was held the second interactive meeting within the framework of the "Mariupol Space for Peace" Project, during which college kids along with concerned locals discussed the sensitive and burning issue of deportation of different ethnic groups. Particular attention was paid to the tragedy of the Crimean Tatar people and its role in the history of Ukraine. On 22nd of September on the Faculty of History of MSU there was held the first interactive meeting in human library format within the framework of “Mariupol Space for Peace” called “Ethnic customs of Pryazovia”. 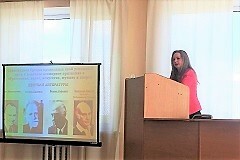 On September 24 at the Faculty of Greek Philology and Translation of Mariupol State University an open lecture by the Consul General of the Hellenic Republic in Mariupol Eleni Georgopoulou was held on topic "Contribution of Greece to world culture over the past 3000 years".